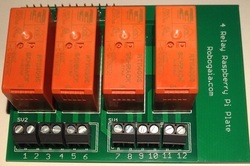 Each relay is rated for 12A . WARNING ! High voltages are dangerous and can be deadly . Even though the relays are rated for 250 VAC the relay traces are not isolated . We do not recommend using the board to command voltages more than 24 volts. IMPORTANT ! Model B Revision 2 of Raspberry Pi board needs robogaia_4_relay_raspberry_plate_v2_code_install.tar.gz . If the old version is installed then Relay3 will not work. The plate sits on top of Raspberry Pi board . from the bottom of the page on your Raspberry Pi in the temporary foder that was just created. Now you are ready to use the relays. The tutorial and the code is here. Starting with the Flask framework tutorial is here.